The last two weeks have been filled with busy work and lots of driving, but also very enjoyable moments with visits to interesting friends and tasting their wines. My travels took me through the south of the beautiful Santa Cruz Mountains to Richard Alfaro’s estate Alfaro Family Vineyards, the amazing in wintertime Sonoma Valley, Napa Valley, the Russian River Valley and in the midst of old vines in Dry Creek Valley seeing my friend Dylan Sheldon of Sheldon Wines in his tasting room in Sebastopol. I tacked close to 400 Miles on the car and enjoyed numerous wines before returning to my hometown of Carmel Valley and another sampling of barrels at Parsonage Village Vineyard with Jennifer Pandol of Pandol Wines and Bill Parsons the winegrower at Parsonage. All friends and all makers of wonderful wines, and yes I feel blessed to have them as friends and to have access to their vines. My notes on their wines and reviews on their latest stuff starts below! Before delving into new and future releases, I want to share something I just read in the Financial Times (Newspaper) today, in the section on Slovenia, an article entitled “Ancient vine nursed back to life” by Kester Eddy. < www.ft.com/slovenia-2008 > This semi retired winemaker 81 year old Tone Zafosnik, is taking care of a 400 year old grape vine. Amazing, and now in the Guinness Book of Records oldest vine in the world, this old little vine of Modra Kavcina, a native grape of parts of Slovenia and mainly Croatia still is producing fruit of which Tone Zafosnik makes wine from. In fact it is a heritage vine that has made wine that has been sipped by the likes of Pope John Paul the second, Emperor Akihito of Japan and former President of the United States of America, Bill Clinton! The mayor of Maribor (Slovenia’s second city, after the capital of Ljubljana) was quoted as being “very grateful” to Zafosnik for his efforts to save this old vine, and I am too, that is awesome to have such history saved and honored. Zafosnik also credits Roma (Gypsies) squatters for helping save this vine from neglect, as the vine itself was left derelict at an ancient home in an old neighborhood, and he says that the city has allowed the gypsies to remain in the basement as long as they help the vine survive, which they have. Zafosnik is the official caretaker of this little piece of history and let us hope lives a long time as well. Last week I posted the wine of the week, it was the stunning Alfaro Family Vineyards 2007 Chardonnay, and after visiting Alfaro’s estate I can say they is a lot more exciting wines to follow shortly. 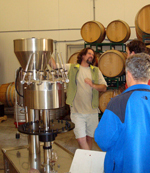 I was able to try Richard’s estate Syrah (2007) just before bottling and I was very happy with his results, this is going to be an excellent wine with lots of fruit and character that should be ready for sales in the early part of next year. While visiting Richard, he was giving some winemaking Hungarians the behind the scenes tour of his winery and was loving every minute of it, happily explaining everything to them and letting them in on all of his secrets and showing off his latest winemaking gizmos and tools, as well as his bottling and label machines too. I enjoyed learning how to pronounce Furmit (for-met) Hungary’s most famous white grape, the one we know and that goes into their sweet wine, the famed Tokaji Essencia. A wine that rivals Chateau D’ Yquem! He is also ready to release some of the 2007 Martin Alfaro Pinot Noirs, which also show wonderful promise from a near perfect vintage for Pinot. Sadly Joe Martin and Richard are ending their partnership and the Martin Alfaro label looks set to go away after this last vintage, though I was relieved to learn that Richard is set to keep contracts with the top vineyards and just put them into his own label, including the Garys’ and Schultze Vineyards that have wowed me for the last few years. The Martin Alfaro wines have been renowned for high quality and for being an amazing value in top wine. There is no question Joe Martin and the Martin Alfaro label will be sorely missed and I wish Joe all the best his future projects. Before they disappear they is some great stuff to get a hold of like the Chard and Pinot from the Sleepy Hollow Vineyard, the beautiful Santa Cruz Mountain Chardonnay and I can’t wait to get some of the 2007 Garys’ Vineyard Pinot Noir from the Santa Lucia Highlands, one of the world’s greatest sites. Plus the surprising and pretty 2007 Franscioni Vineyard Pinot (see below) from Monterey County, that shows rich sweet fruit and toasty oak, which is just being released now. The Martin Alfaro wines will be still available through Alfaro Family Vineyards until they are sold out, which after tasting some of the latest wines, should be sooner rather than later, so check them out quick. On a related note Richard Alfaro provided Jennifer Pandol with some beautiful grapes from his estate vineyards for her Pandol Wines label Pinot Noir for one of her 2008 wines. She has blown me away with her first two bottlings, the 2005, which make my Top Ten wines last year, and the equally impressive 2006 vintage, a wine that should be reaching the market soon, so stay tuned. 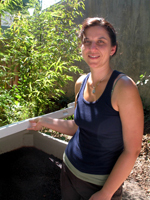 She used the Schultze Family Vineyard for her 2005 and 2006 Pinots, and focuses on fruit from the Santa Cruz Mountains. This tiny winery in Santa Cruz looks set to keep rocking in the years to come and the 2008 Pinot from the Alfaro Vineyard is settling in nicely in barrel, along with a batch of Pinot Noir she sourced from Jack Galante’s Almond Flat Vineyard above his ranch in Carmel Valley, which should prove to be very interesting. Recently she joined me for a tasting of Carmel Valley’s Parsonage Village Vineyard and we got to re-visit Bill Parson’s 2007 vintage reserves in barrel and even got a first taste of his new Pinot Noir from Cedar Lane Vineyard, just past Carmel Valley in Arroyo Seca and his select lot of reserve Syrah that goes into his “Cuvee Rocco”. All the ‘07’s are coming along well, in fact they are fantastic wines, but you’ll have to be very patient as they need up to another year in barrel, yes they are that big and powerful! The 2008 Syrah for the “Cuvee Rocco” was electric purple blue and was full of fat fruit and youthful sweetness and should turn out to be another stellar wine. Jennifer was interested in the 2008 Pinot, and we got to taste two barrels of Pinot from the same vineyard, but from different clones (115 & 777) and they tasted remarkable different, both showed good fruit, though the 777 seemed more interesting at this point, for myself anyway. A Big kudos goes out to Bill for his great wines, and a big thank you for letting us in the barrel room to taste his new babies. Then there was my blast through Sonoma and Napa Counties and time in Dry Creek and the Russian River Valleys to see a few places and friends. I must also mention I went to dinner at Central Market Restaurant in downtown Petaluma, and highly recommend you do, tell Tony I sent you! This great eatery uses only local produce and farms for their menu and use only a wood fired oven to cook everything, plus they also have a raw list of specials. Everything we tried was out of this world good and the wine list is full of rarities and some interesting by the glass selections. I had the slow cooked pork confit over white beans, red peppers and bacon that was sublime. On my way to see my friend and winemaker Dylan Sheldon of Sheldon Wines in Sebastopol, I detoured my way through the old vines of the Dry Creek Valley, where I stopped in on Ridge Vineyards’ Lytton Springs tasting room and tasted a few nice wines, including the serious good Lytton Springs Zinfandel blend. After buying one and the rare Grenache/Syrah blend I headed down the road, Dry Creek Road, to a new winery Truett-Hurst and tasted their very nice Zinfandels and tasty Petite Sirah. These guys are brand new and still getting things together with the plan to include only organic and or bio-dynamic grapes in the near future, so be sure to check them out when you get up this way. Then I made it to the Sheldon Wines tasting room, well, after a slight wrong turn that led me through the redwoods and through the ultra out of the way Guerneville, a cute small town on the Russian River and hidden by towering redwoods with a microbrewery Stumptown Brewing as one of its (only) highlights. Dylan and I go back a ways and he is in no small way responsible for my hunger to learn about terroir and my interest in rare grapes. Dylan and I helped put on wine classes, and he is a showman as well as a true certifiably committed wine geek in the nicest sense! 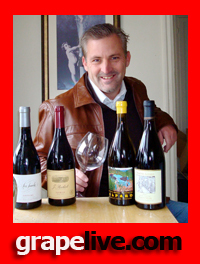 Now he is a passionate winemaker that goes to great lengths to showcase unique terroirs and pure wines. 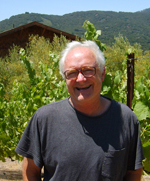 My visit was supposed to be all about the release of his 2006 Marin County Pinot Noir from the Kendric Vineyard, though as always the case with Dylan is was much more than that, with him pulling out two wines that he has kept secret in barrel. These were an absolutely glorious 2007 Anderson Valley Pinot Noir from the Roma’s Vineyard and an intriguing wine made up of a rare Spanish grape most commonly used as a blending grape in Rioja or in weird Basque reds, Graciano, it is a small yielding variety that is spicy and fragrant and Sheldon’s was all that and more. It was hard not to love them, and of course I did! 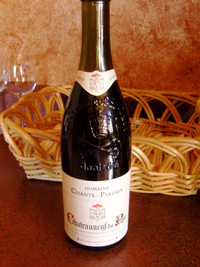 The new release 2006 Pinot didn’t disappoint and proved to be pure and lush with pretty and delicate flavors that were classic in character. Bravo Dylan, the wines were unique and stylish, you nailed it my friend! I also tried Sheldon’s 2007 Sleepy Hollow (Monterey) Chardonnay, 92 Points, the 2007 Viognier, 90 Points, and their flagship wine, the 2005 Vinolocity (Grenache & Syrah blend) Santa Barbara County, 93 Points. 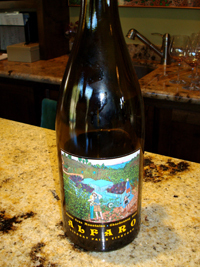 2007 Alfaro Family Vineyards Chardonnay Lindsay-Page Vineyard, Estate, Santa Cruz Mountains. This wine is fast becoming a cult hit, and yet again proves to be one of the best Chardonnays in the state, following the remarkable 2006; this vintage shows even more elegance and focus! I loved the last vintage and thought I was going to be let down, but I am happy to report that this wine is even more balanced and pure, and gives all the complexities and depth I had come to enjoy and praise. The youth still shows and there is a lot more to come from this Chardonnay, but all the pieces are falling into place nicely all ready. Look for the body to fill out in a year in bottle, though it is really good now with beautiful layers of fruit and lifting acidity. The wine starts with white flowers, orange blossoms, lemon custard and green apples, leading into a creamy palate of clear butter, pear, tangerine, kiwi and sweet fig. There is a hint of clove, Hazelnut, smoke and a lovely mineral essence in the background, finishing full and with a whiff of spicy vanilla and perfectly framing French oak. This wine feels as pretty and classy as any premier cru Burgundy, and should get even better in the coming months and years!